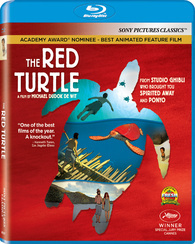 The Red Turtle is a striking collaboration between the French filmmaker/animator Michael Dudok de Wit (he helmed the 2000 Oscar-winning Best Animated Short Father and Daughter) and the Japanese animation production house Studio Ghibli (the home of most of the legendary Hayao Miyazaki’s work). The power in The Red Turtle lies in its straight-forwardness. Employing a clean, simple style of animation (it looks almost hand-drawn) and a nearly wordless audio design that enhances all the sounds that a storm-swept tropical island has to offer, this gentle film is startlingly cinematic in its purity. Most of the visuals are framed in medium and long shots, eschewing close-ups for a wider perspective, almost as if we, the viewers, are the natural world observing the life of our shipwrecked protagonist. At the same time, this visual approach puts us on an equal field with the film’s players as a series of both realistic and semi-mystical developments occur. The film’s ending is both a happy and sad one, an inevitability that befalls all of us, whether our lives are touched by fantasy or not. But life, as we all know, goes on. Bonus features on the Blu-ray disc include a pair of making-of featurettes, both presented in French with English subtitles, and a AFI Fest Q&A with the filmmaker that’s presented in English. 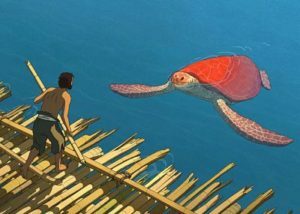 A one-of-a-kind film that lingers long in the memory, “The Red Turtle” suggests that when it comes to animation, there are still whole new worlds to explore.